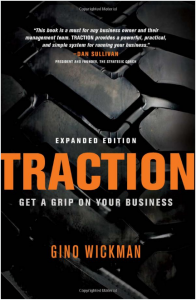 Now that you've read Traction, what next? You’ve just finished reading Traction® and you’re eager to try it out yourself. The next steps depend on where you want to begin. There are two ways to begin: hire an implementer or implement on your own. Follow the EOS Process purely. The community is here to help. If you get ever get stuck, the EOS implementer you worked with is happy to help. Just remember, EOS takes time to implement correctly. For it to work, you must to stick with it. We built Traction® Tools with both scenarios in mind. Whether you’re a self-implementer or you’ve worked with a world-class professional implementer, we’re here to help. We’re focused on providing quality software for organizations implementing the Entrepreneurial Operating System®. In fact we use EOS ourselves. And because all of our software is EOS Pure, you can be sure you’re operating correctly right off the bat. At our core, we’re accountability software and we’ve got a passion for productivity.